We’ve covered a lot of ground in the previous post, but we’re not quite there yet. We need to look at a few more things in order to gain some kind of ‘physical’ understanding’ of Maxwell’s equations, as opposed to a merely ‘mathematical’ understanding only. That will probably disappoint you. In fact, you probably wonder why one needs to know about Gauss’ and Stokes’ Theorems if the only objective is to ‘understand’ Maxwell’s equations. The heat flow vector h, whose magnitude is the thermal energy that passes, per unit time and per unit area, through an infinitesimally small isothermal surface, so we write: h = |h| = ΔJ/ΔA. The gradient vector ∇T, whose direction is opposite to that of h, and whose magnitude is proportional to h, so we can write the so-called differential equation of heat flow: h = –κ∇T. The components of the vector dot product ΔT = ∇T•ΔR = |∇T|·ΔR·cosθ. That equation says that the component of the gradient vector ∇ψ along a small displacement ΔR is equal to the rate of change of ψ in the direction of ΔR. And then we had three important theorems, but I can imagine you don’t want to hear about them anymore. So what can we do without them? Let’s have a look at Maxwell’s equations again and explore some linkages. The curl of a vector field C (i.e. ∇×C) represents its circulation, i.e. its (infinitesimal) rotation. Its divergence (i.e. ∇•C) represents the outward flux out of an (infinitesimal) volume around the point we’re considering. Let’s start at the bottom, i.e. with equation (4). It says that a changing electric field (i.e. ∂E/∂t ≠ 0) and/or a (steady) electric current (j/ε0) will cause some circulation of B, i.e. the magnetic field. It’s important to note that (a) the electric field has to change and/or (b) that electric charges (positive or negative) have to move in order to cause some circulation of B: a steady electric field will not result in any magnetic effects. ∇•E = ρ/ε0. In this equation, we have ρ, which represents the so-called charge density, which describes the distribution of electric charges in space: ρ = ρ(x, y, z). To put it simply: ρ is the ‘amount of charge’ (which we’ll denote by Δq) per unit volume at a given point. Hence, if we consider a small volume (ΔV) located at point (x, y, z) in space – an infinitesimally small volume, in fact (as usual) –then we can write: Δq = ρ(x, y, z)ΔV. [As for ε0, you already know this is a constant which ensures all units are ‘compatible’.] This equation basically says we have some flux of E, the exact amount of which is determined by the charge density ρ or, more in general, by the charge distribution in space. ∇×E = 0. That means that the curl of E is zero: everywhere, and always. So there’s no circulation of E. We call this a curl-free field. ∇•B = 0. That means that the divergence of B is zero: everywhere, and always. So there’s no flux of B. None. We call this a divergence-free field. B is a field with zero divergence and a given curl. Yeah, but why can’t we analyze fields that have both curl and divergence? The answer is: we can, and we will, but we have to start somewhere, and so we start with an easier analysis first. Electrostatics: (1) ∇•E = ρ/ε0 and (2) ∇×E = 0. Magnetostatics: (1) ∇×B = j/c2ε0 and (2) ∇•B = 0. Now, I won’t go through all of the particularities involved. In fact, I’ll refer you to a real physics textbook on that (like Feynman’s Lectures indeed). My aim here is to use these equations to introduce some more math and to gain a better understanding of vector calculus – an understanding that goes, in fact, beyond the math (i.e. a ‘physical’ understanding, as Feynman terms it). If ∇×C = 0, there is a ψ such that C = ∇ψ. If ∇•D = 0, there is an A such that D = ∇×A. For B, there is a so-called vector potential A such that B = ∇×A. The whole game is then to compute Φ and A everywhere. We can then take the gradient of Φ, and the curl of A, to find the electric and magnetic field respectively, at every single point in space. In fact, most of Feynman’s second Volume of his Lectures is devoted to that, so I’ll refer you that if you’d be interested. As said, my goal here is just to introduce the basics of vector calculus, so you gain a better understanding of physics, i.e. an understanding which goes beyond the math. I know this looks messy, but it’s actually not so complicated. The interactions between the electric and magnetic field are governed by equation (2) and (4), so equation (1) and (3) is just ‘statics’. Something needs to trigger it all, of course. I assume it’s an electric current (that’s the arrow marked by ). Indeed, equation (4), i.e. c2∇×B = ∂E/∂t + j/ε0, implies that a changing electric current – an accelerating electric charge, for instance – will cause the circulation of B to change. More specifically, we can write: ∂[c2∇×B]/∂t = ∂[j/ε0]∂t. However, as the circulation of B changes, the magnetic field B itself must be changing. Hence, we have a non-zero time derivative of B (∂B/∂t ≠ 0). But, then, according to equation (2), i.e. ∇×E = –∂B/∂t, we’ll have some circulation of E. That’s the dynamics marked by the red arrows . Now, assuming that ∂B/∂t is not constant (because that electric charge accelerates and decelerates, for example), the time derivative ∂E/∂t will be non-zero too (∂E/∂t ≠ 0). But so that feeds back into equation (4), according to which a changing electric field will cause the circulation of B to change. That’s the dynamics marked by the yellow arrows . The ‘feedback loop’ is closed now: I’ve just explained how an electromagnetic field (or radiation) actually propagates through space. Below you can see one of the fancier animations you can find on the Web. The blue oscillation is supposed to represent the oscillating magnetic vector, while the red oscillation is supposed to represent the electric field vector. Note how the effect travels through space. This is, of course, an extremely simplified view. To be precise, it assumes that the light wave (that’s what an electromagnetic wave actually is) is linearly (aka as plane) polarized, as the electric (and magnetic field) oscillate on a straight line. If we choose the direction of propagation as the z-axis of our reference frame, the electric field vector will oscillate in the xy-plane. In other words, the electric field will have an x- and a y-component, which we’ll denote as Ex and Ex respectively, as shown in the diagrams below, which give various examples of linear polarization. Light is, of course, not necessarily plane-polarized. The animation below shows circular polarization, which is a special case of the more general elliptical polarization condition. Allow me to make a small digression here, which has more to do with physics than with vector analysis. You’ll have noticed that we didn’t talk about the magnetic field vector anymore when discussing the polarization of light. Indeed, when discussing electromagnetic radiation, most – if not all – textbooks start by noting we have E and B vectors, but then proceed to discuss the E vector only. Where’s the magnetic field? We need to note two things here. You’ll say: So what? That doesn’t answer the question above. Why do physicists leave out the magnetic field vector in all those illustrations? If you allow me, I’ll take this opportunity to insert another warning, one that’s quite specific to how we should interpret this concept of an electromagnetic wave. When we say that an electromagnetic wave ‘travels’ through space, we often tend to think of a wave traveling on a string: we’re smart enough to understand that what is traveling is not the string itself (or some part of the string) but the amplitude of the oscillation: it’s the vertical displacement (i.e. the movement that’s perpendicular to the direction of ‘travel’) that appears first at one place and then at the next and so on and so on. It’s in that sense, and in that sense only, that the wave ‘travels’. However, the problem with this comparison to a wave traveling on a string is that we tend to think that an electromagnetic wave also occupies some space in the directions that are perpendicular to the direction of travel (i.e. the x and y directions in those illustrations on polarization). Now that’s a huge misconception! The electromagnetic field is something physical, for sure, but the E and B vectors do not occupy any physical space in the x and y direction as they ‘travel’ along the z direction! 2. You’ll say: I don’t give a damn about other reference frames. Answer the question. Why are magnetic fields left out of the analysis when discussing electromagnetic radiation? The answer to that question is very mundane. When we know E (in one or the other reference frame), we also know B, and, while B is as ‘essential’ as E when analyzing how an electromagnetic wave propagates through space, the truth is that the magnitude of B is only a very tiny fraction of that of E.
I’ve analyzed these formulas in one of my other posts (see, for example, my first post on light and radiation), and so I won’t repeat myself too much here. However, let me recall the basics of it all. The eR′ vector is a unit vector pointing in the apparent direction of the charge. When I say ‘apparent’, I mean that this unit vector is not pointing towards the present position of the charge, but at where is was a little while ago, because this ‘signal’ can only travel from the charge to where we are now at the same speed of the wave, i.e. at the speed of light c. That’s why we prime the (radial) vector R also (so we write R′ instead of R). So that unit vector wiggles up and down and, as the formula makes clear, it’s the second-order derivative of that movement which determines the electric field. That second-order derivative is the acceleration vector, and it can be substituted for the vertical component of the acceleration of the charge that caused the radiation in the first place but, again, I’ll refer you my post on that, as it’s not the topic we want to cover here. What we do want to look at here, is that formula for B: it’s the cross product of that eR′ vector (the minus sign just reverses the direction of the whole thing) and E divided by c. We also know that the E and eR′ vectors are at right angles to each, so the sine factor (sinθ) is 1 (or –1) too. In other words, the magnitude of B is |E|/c = E/c, which is a very tiny fraction of E indeed (remember: c ≈ 3×108). Let me spell it out. Take the force formula: F = q(E + v×B) = qE + q(v×B). When our electromagnetic wave hits something real (I mean anything real, like a wall, or some molecule of gas), it is likely to hit some electron, i.e. an actual electric charge. Hence, the electric and magnetic field should have some impact on it. Now, as we pointed here, the magnitude of the electric force will be the most important one – by far – and, hence, it’s the electric field that will ‘drive’ that charge and, in the process, give it some velocity v, as shown below. In what direction? Don’t ask stupid questions: look at the equation. FE = qE, so the electric force will have the same direction as E.
But we’ve got a moving charge now and, therefore, the magnetic force comes into play as well! 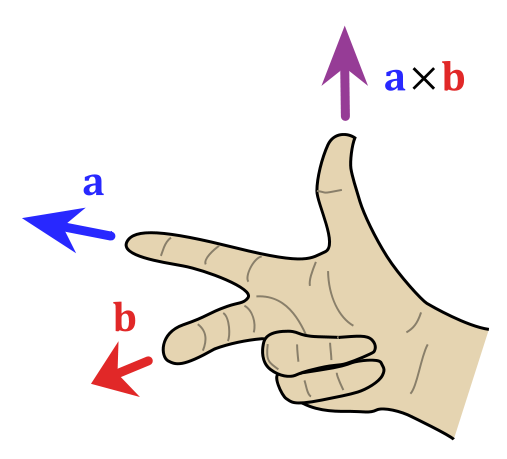 That force is FM = q(v×B) and its direction is given by the right-hand rule: it’s the F above in the direction of the light beam itself. Admittedly, it’s a tiny force, as its magnitude is F = qvE/c only, but it’s there, and it’s what causes the so-called radiation pressure (or light pressure tout court). So, yes, you can start dreaming of fancy solar sailing ships (the illustration below shows one out of of Star Trek) but… Well… Good luck with it! The force is very tiny indeed and, of course, don’t forget there’s light coming from all directions in space! Jokes aside, it’s a real and interesting effect indeed, but I won’t say much more about it. Just note that we are really talking the momentum of light here, and it’s a ‘real’ as any momentum. In an interesting analysis, Feynman calculates this momentum and, rather unsurprisingly (but please do check out how he calculates these things, as it’s quite interesting), the same 1/c factor comes into play once: the momentum (p) that’s being delivered when light hits something real is equal to 1/c of the energy that’s being absorbed. So, if we denote the energy by W (in order to not create confusion with the E symbol we’ve used already), we can write: p = W/c. Now I can’t resist one more digression. We’re, obviously, fully in classical physics here and, hence, we shouldn’t mention anything quantum-mechanical here. 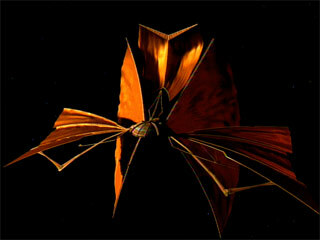 That being said, you already know that, in quantum physics, we’ll look at light as a stream of photons, i.e. ‘light particles’ that also have energy and momentum. The formula for the energy of a photon is given by the Planck relation: E = hf. The h factor is Planck’s constant here – also quite tiny, as you know – and f is the light frequency of course. Oh – and I am switching back to the symbol E to denote energy, as it’s clear from the context I am no longer talking about the electric field here. In this equations, m0 stands, obviously, for the rest mass of the particle, i.e. its mass at v = 0. Now, photons have zero rest mass, but their speed is c. Hence, both equations reduce to p = E/c, so that’s the same as what Feynman found out above: p = W/c. Of course, you’ll say: that’s obvious. Well… No, it’s not obvious at all. We do find the same formula for the momentum of light (p) – which is great, of course – but so we find the same thing coming from very different necks parts of the woods. The formula for the (relativistic) momentum and energy of particles comes from a very classical analysis of particles – ‘real-life’ objects with mass, a very definite position in space and whatever other properties you’d associate with billiard balls – while that other p = W/c formula comes out of a very long and tedious analysis of light as an electromagnetic wave. The two analytical frameworks couldn’t differ much more, could they? Yet, we come to the same conclusion indeed. So we have yet another set of operators here: not less than six, to be precise. You may think that we can have some more, like (∇×∇), for example. But… No. A (∇×∇) operator doesn’t make sense. Just write it out and think about it. Perhaps you’ll see why. You can try to invent some more but, if you manage, you’ll see they won’t make sense either. The combinations that do make sense are listed above, all of them. Now, while of these combinations make (some) sense, it’s obvious that some of these combinations are more useful than others. More in particular, the first operator, ∇2, appears very often in physics and, hence, has a special name: it’s the Laplacian. As you can see, it’s the divergence of the gradient of a function. So that covers (1) and (2) above. What about the other ‘operators’? Let me start at the bottom. Equations (5) and (6) are just what they are: two results that you can use in some mathematical argument or derivation. Equation (4) is… Well… Similar: it’s an identity that may or may not help one when doing some derivation. So… That should conclude my little introduction to vector analysis, and so I’ll call it a day now. 🙂 I hope you enjoyed it.